A few years ago, the Illinois Health Facilities & Services Review Board wrestled over proposals for major new hospitals. More recently, board members have had to become expert on such matters as diabetes and renal care. While new hospital construction has slowed, there has been a surge in the development of dialysis centers. The June 5 meeting of the board had nine proposals for dialysis centers. "Our applications track where the need for healthcare is currently," says Courtney Avery, administrator of the board. "Right now there is a real need for more dialysis centers." Indeed, dialysis has become a major growth field as diabetes and other kidney diseases have exploded. Now the seventh-leading cause of death in the nation, diabetes affects 30.3 million Americans, or more than 9 percent of the population, according to the Centers for Disease Control & Prevention, which estimates that another 84 million Americans have pre-diabetes, a condition that if not treated can lead to Type 2 diabetes within five years. More than 1.5 million new cases of diabetes are being diagnosed each year in the U.S., the CDC reports. Dialysis treatment has come to be dominated by two big companies, DaVita of Denver and Fresenius of Germany. Of the 321 renal care facilities in a list compiled by the Illinois Department of Public Health, DaVita alone owns at least 75—50 of them in metro Chicago. In its latest quarter, DaVita's dialysis treatment volume was up nearly 5 percent, which also parallels its growth in the Chicago market, according to Gaurav Bhattacharyya, the company's divisional vice president based here, though in certain sectors of Chicago, growth rates have spiked close to 10 percent, he says. 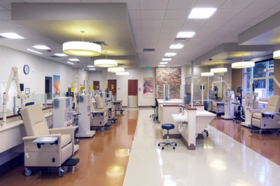 Fresenius owns another 83 dialysis centers in the state. "In most places in recent years, we've come to represent one-third of the dialysis market and Fresenius has one-third, with the remainder of care provided by independents," Bhattacharyya says. Growth is attributed to rising obesity and hypertension, better diagnosis and the rise in coverage by Medicare. "In the past, many cases of diabetes were not being adequately controlled," says Joel Shalowitz, a retired professor of preventive medicine at Northwestern University's Feinberg School of Medicine and a consultant. "Now more people are getting dialysis treatment earlier. And the federal government has changed reimbursement to make dialysis less lucrative for hospitals. They don't have the specialization and economies of scale that enable a company like DaVita to be profitable at this." Dialysis center planning is made easy by public data networks that track nearly every dialysis patient in the nation. DaVita looks for markets where existing renal centers are operating at 75 percent of capacity or more, then begins looking for sites to build centers typically with between 12 and 16 treatment stations, staffed largely by nurses. The centers cost $2 million to $3 million to build and usually span less than 10,000 square feet. In June it got approval to build facilities in Woodridge, Villa Park and the Auburn Park neighborhood of Chicago. An application to build in Waukegan was rejected in a close 4-3 vote, though the company intends to repackage its supporting evidence and come back with that plan to the board soon. The typical dialysis patient spends four hours at a time three days a week in treatment. Bhattacharyya says that convenience is a prime consideration. "The state looks at treatment radiuses of 5 miles. At DaVita we are looking at a radius of 2 miles and less in many cases," he explains. "The state says that a new clinic is not needed until existing dialysis capacity in the area is 80 percent occupied. We contend that when a center is 80 percent occupied, then the only open appointments are likely to be at odd hours, maybe 8 o'clock at night, when some patients are not going to make the effort to show up." Independent physician groups are looking for ways to wedge between DaVita and Fresenius. Kidney Care Center, a consortium of 30 nephrologists based in Joliet, got approval in June to build a 14-station, $1.5 million dialysis center on the west side of Elgin despite arguments from critics that the market was already overserved: It had both a DaVita and Fresenius in town, along with 14 other dialysis centers within a 30-minute drive. Despite the skeptics, the vote in favor of Kidney Care's project was 5-2. "We have made the argument that it's not about the capacity of dialysis centers in the area, it's about what kind of care people have access to," says Dr. Tunji Alausa, medical director of Kidney Care, which will be opening dialysis centers in McHenry and the Beverly neighborhood of Chicago by September. It already has centers operating in Oak Lawn and Olympia Fields. "We want to offer patients a more boutique service, where they will get training in how to eventually do dialysis from their homes," Alausa says. "The big two names in this business offer a more corporate approach. DaVita and Fresenius are too big and dominant. By referring patients to independent facilities like ours we can guarantee better continuity of care." "Dialysis centers are the health industry's growth story" originally appeared in Crain's Chicago Business.